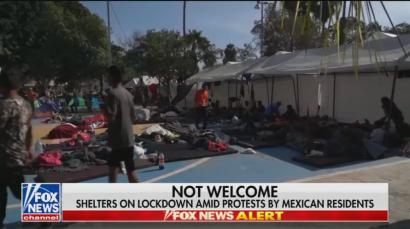 The camp set up for the Central American migrant caravan in Tijuana was on “lockdown” on Sunday as Mexican residents of the city attempted to storm the area in protest. The unwelcome arrival of the caravan had put tremendous pressure on Tijuana’s resources resulting in many locals taking to the streets in opposition. It was a serious and dangerous development that went completely unreported during ABC’s World News Tonight and NBC Nightly News Monday evening. The U.S. today partially closed the busiest border crossing with Mexico for several hours to install new security barriers. Cars backed up in Tijuana. There were protests there over the weekend by locals who are opposed to the migrant caravans from Central America. 3,000 have already poured into Tijuana hoping for asylum in the U.S.
A feature of La Jeunesse’s report was the testimonials he received from Tijuana residents. “We are here because our government has not taken control of what we call invasions,” Manuel Roses said. An unidentified woman told him: “I'm not really in favor of them coming the way they did. You know, to me, it feels like they invaded.” “I tell them it's better for you to get a job and start working right. And then out you head trying to cross the border,” resident Alberto Perez explained. As for Spanish-language networks Telemundo and Univision, they both drew attention the anti-caravan protest in Tijuana. “At the top of their lungs, they asked for only one thing: the expulsion of the migrants from Mexico,” Telemundo correspondent Raul Torres reported. “The United States closed the traffic for some hours at the pedestrian bridge between Tijuana and San Diego, to install new safety barriers in what looks like an attempt at containing the possible massive entry of Central American migrants that face strong rejection in Tijuana from sectors of the population in that city,” noted Univision anchor Enrique Acevedo. Instead of noting the protests, ABC spent time hyping the countdown to Black Friday and NBC praised the Cleveland Indians for unveiling their new politically correct logo. JEFF GLOR: The U.S. today partially closed the busiest border crossing with Mexico for several hours to install new security barriers. Cars backed up in Tijuana. There were protests there over the weekend by locals who are opposed to the migrant caravans from Central America. 3,000 have already poured into Tijuana hoping for asylum in the U.S.
BRET BAIER: Officials, as we mentioned with the Homeland Security Department, say they have identified more than 500 criminals traveling with that caravan flow of Central American migrants headed to the U.S. They say the caravan is made up mostly of single adult or teen males whove place women and children in front of the line in an effort to gain sympathetic media coverage. 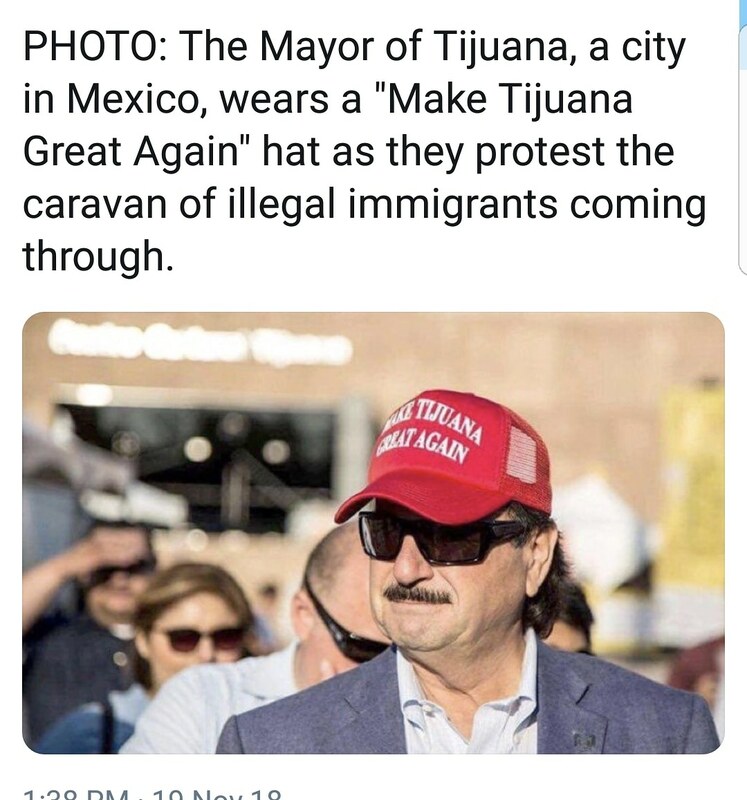 And there is new backlash tonight against some of those migrants, but its not from the Trump administration from Mexicans living in Tijuana. National correspondent William La Jeunesse is in Tijuana again tonight. Good evening, William. WILLIAM LA JEUNESSE: Good evening, Bret. You know, illegal immigration is not new to Mexico. Generations of Central Americans have used it as a stepping stone into the United States but this caravan, the numbers, how theyve crossed, how theyve acted seemed to have awakened a silent now vocal minority against them. MANUEL ROSES (Tijuana resident): We are here because our government has not taken control of what we call invasions. LA JEUNESSE: Shouting Hondurans go home and viva Mexico, riot police Sunday stopped hundreds of Mexicans try to storm the migrant shelter. They fear crime, a loss of jobs, depressed wages in a country where 40 percent already live in poverty. UNIDENTIFIED WOMAN: I'm not really in favor of them coming the way they did. You know, to me, it feels like they invaded. LA JEUNESSE: Nearby, a counter-protest, supporters say Mexico should welcome and protect immigrants. LA JEUNESSE: Shelter, Sunday, remained on lockdown until protesters went home. LA JEUNESSE: More than 6,000 caravan migrants arrived in Tijuana. Their shelter looking now like a refugee camp as many realized they cannot easily cross the border and any asylum interview is at least five weeks away. ALBERTO PEREZ (Tijuana resident): I tell them it's better for you to get a job and start working right. And then out you head trying to cross the border. So, by shutting down lanes, slowing traffic, increasing wait times President Trump is sending a message to Mexico City: to stop these caravans on their southern borders or face consequences here on the north. It's a language, Bret, that everyone understands, time is money. Bret? BAIER: William La Jeunesse live in Mexico tonight. William, thank you. They don’t “report the news”. Turn on the TV. Let’s watch the evening narrative. the mass media work for our rulers to control ideas of the masses. Not for just for now, but forever. We are a NATION with BORDERS. Now if we could only convince the GOP to side with the citizens and the rule of law and President Trump. Apparently another protest from Tijuana residents will take place tomorrow. Ive been following live via face book thru either Paloma for Trump or Amy Sutton. Id recommend checking them out for non-msm first hand info. Shoot... make Honduras and Mexico great too... if they will all start taking themselves seriously. It’s hardly patriotic to be wishing your citizens away. I doubt it's a minority. They always marginalize those who want to protect their homes by trying to imply they are not mainstream but a small fringe group. Fake news is also whats not reported for the wrong reason. The Fake News is showing old footage of people climbing over our Ocean Area Fence. This is what it really looks like - no climbers anymore under our Administration! Even if they climbed..they cannot jump...Razor Wire on the US side of the border wall. My Mexican friend posted on Facebook a Mexican article showing several Hondurans hung from a bridge. The gist of the article is that the cartels are now executing the invaders because they are embarrassing Mexico by marching with the flags of their countries, trashing the places they pass through, being ungrateful for what is being given to them and discarding donated clothes and shoes everywhere. There is a viral video in Mexico of a Honduran woman complaining that they were given only beans and tortillas, saying that where she is from that is pig food. These invaders are not helping themselves. In Tijuana, the caravan has awakened the no longer silent majority. That was evident on Sunday. Btw, I watched the rocks being thrown  live . It was Honduran men who were throwing rocks at the residents of Tijuana. The residents were running to get away from being hit. But, a fake news station reported it the other way around. Since then, even Fox, has repeated this lie. I saw that. Those pics are old. But, there is a rumor going on that the cartel will start taking things into their own hands. Not because of ingratitude, but because they are creating issues that are interfering with their operation. (such as the border being shut down for one).